Description: Nothing's more personalized than your "signature" in print...literally! 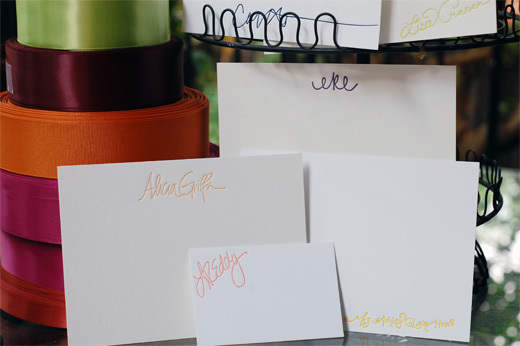 With our new signature stationery line, we'll flat print or letterpress your handwriting onto your calling or note card. It's simple! Sign an 8.5" x 11" piece of blank white paper with a black sharpie. Choose your paper color (white or ivory), quantity (in 50's), ink color, envlope liners, etc. Send it to us (scan it in high resolution or send it in the mail)and we'll send you a complimentary proof. After receivng your approval we'll go to print and VIOLA! Your very own, very personal Signature Stationery! But be sure to allow plenty of time, this beautiful stationery could take 3-4 weeks for delivery.